Back in October, shortly after director Taika Waititi signed on to direct Thor: Ragnarok, a report surfaced that claimed this third Thor adventure was the Marvel Cinematic Universe's darkest movie yet. The report claimed that Taika Waititi, best known for light-hearted indie comedies like Eagle vs. Shark and last year's What We Do In the Shadows, was brought on to add some comedic balance into the mix. While we'll have to wait until next November to see how this balance plays out when Thor 3 hits theaters, the filmmaker showed off his humorous side yesterday in a spirited Twitter conversation with Marvel directors James Gunn (Guardians of the Galaxy) and Peyton Reed (Ant-Man). Last night, the director took to his Twitter page to ask James Gunn and Peyton Reed how many explosions he should put in his movie. The director added that he currently only has one explosion, and it's "not so much an explosion - more of a 'boink' sound." Peyton Reed was the first to reply, joking that Marvel requires at least 42 explosions. James Gunn chimed in stating that he should have 11 school busses of school children exploding, adding that "people love that in superhero movies." Taika Waititi went on to joke about whether or not he has to add "that purple dude in the floating chair" (a.k.a. Thanos) in his movie, which James Gunn replied is not a Marvel mandate, but instead "federal law." Taika Waititi also joked about getting Spider-Man: Homecoming director Jon Watts to join Twitter, so they could discuss trading titles, since he thinks Spider-Man: Ragnarok and Thor: Homecoming would "rule." He also responded to a fan who wants "100% more" of Lady Sif (Jaimie Alexander), which the director joked would equate to two minutes of screen time. Of course, the director went on to clarify that he's only joking, although he can't confirm anything at this point. Production is scheduled to begin this summer in Australia, with Chris Hemsworth (Thor), Tom Hiddleston (Loki) and Mark Ruffalo (Hulk) set to star, alongside new cast member Tessa Thompson (Creed) in an unspecified role. The actress has been said to be playing "kind of a superhero," who is expected to return in future MCU movies. Natalie Portman, who played Jane Foster in Thor and Thor: The Dark World, is not returning for this sequel, nor is Stellan Skarsgard as Dr. Erik Selvig. The story is rumored to center on a "cosmic road trip" that Thor and Hulk go on, reportedly after Thor is banished from Asgard by the villainous Hela, rumored to be played by Cate Blanchett. It's been rumored that Thor makes his way to a planet full of gladiators, where he's forced to square off against the planet's champion, Hulk. While we wait for more story details, take a look at Taika Waititi's series of tweets below. @JamesGunn@MrPeytonReed Hey guys. When you're making one of these big movies, how many explosions are you supposed to put in? I have one. @JamesGunn@MrPeytonReed And it's not so much an explosion - more of a "boink" sound. @TaikaWaititi@JamesGunn Hmm. That's not gonna cut it, Taika. Check your contract. 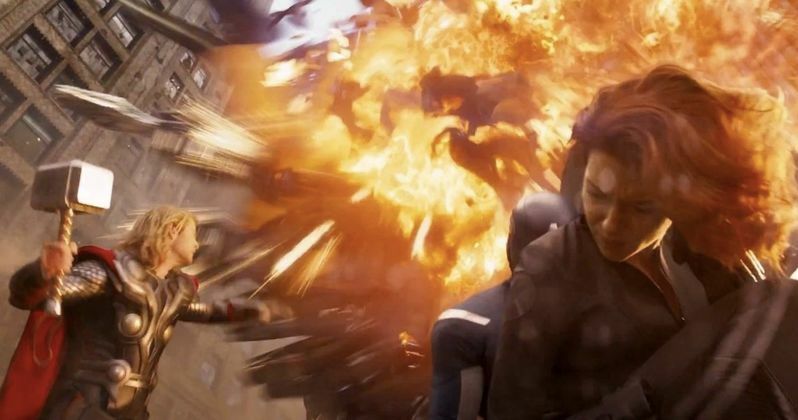 Marvel minimum is 42 onscreen explosions. Required! @TaikaWaititi@JamesGunn And they're strict! They didn't even count my Pym Tech explosion because "technically it's an IMplosion." @scottderrickson Hey man, don't tell anyone at Marvel but I'm freaking out. Strictly confidential! Someone tell Jon Watts to join twitter. I need to know if he wants to swap titles. "Spiderman Ragnarok" and "Thor Homecoming" would rule. Just jokes guys, she's awesome. However I can't confirm anyone or anything.